This paper is part of the Clinical Trial Endpoints for Dialysis Vascular Access Project of the American Society of Nephrology Kidney Health Initiative. The purpose of this project is to promote research in vascular access by clarifying trial end points which would be best suited to inform decisions in those situations in which supportive clinical data are required. The focus of a portion of the project is directed toward arteriovenous access. There is a potential for interventional studies to be directed toward any of the events that may be associated with an arteriovenous access’ evolution throughout its life cycle, which has been divided into five distinct phases. Each one of these has the potential for relatively unique problems. The first three of these correspond to three distinct stages of arteriovenous access development, each one of which has been characterized by objective direct and/or indirect criteria. These are characterized as: stage 1—patent arteriovenous access, stage 2—physiologically mature arteriovenous access, and stage 3—clinically functional arteriovenous access. Once the requirements of a stage 3—clinically functional arteriovenous access have been met, the fourth phase of its life cycle begins. This is the phase of sustained clinical use from which the arteriovenous access may move back and forth between it and the fifth phase, dysfunction. From this phase of its life cycle, the arteriovenous access requires a maintenance procedure to preserve or restore sustained clinical use. Using these definitions, clinical trial end points appropriate to the various phases that characterize the evolution of the arteriovenous access life cycle have been identified. It is anticipated that by using these definitions and potential end points, clinical trials can be designed that more closely correlate with the goals of the intervention and provide appropriate supportive data for clinical, regulatory, and coverage decisions. The Clinical Trial Endpoints for Dialysis Vascular Access project is part of the Kidney Healthcare Initiative (1,2), with a primary goal to identify appropriate clinical trial end points to help design clinical trials which would inform clinical, regulatory, and coverage decisions on new interventions, drugs, biologics, or devices relevant to hemodialysis vascular access. This manuscript summarizes key clinical trial end points that can be considered for these interventions relevant to the arteriovenous (AV) access, e.g., arteriovenous fistula (AVF) and arteriovenous graft (AVG). These end points align with the various phases of the AV-access life cycle (Figure 1, Table 1) that may be affected by new interventional studies. This paper will review the phases of an AV-access life cycle, highlight potential associated problems, and recommend relevant clinical trial end points that would be appropriate in interventional clinical trials addressing these problems. Phases of arteriovenous access life cycle. Published practice guidelines, clinical studies, and other pertinent articles related to AV access were reviewed to develop a list of relevant terms. Using these terms and MEDLINE via PubMed, a literature search was conducted of publications related to AV-access definitions; AV-access creation, development, and maturation; and AV-access complications. Reference lists from relevant manuscripts were examined individually to identify additional pertinent publications. The titles and abstracts of all retrieved citations were reviewed and the full text of potential studies was reviewed by committee members and screened for inclusion. Over 400 full-text articles were reviewed by committee members to establish a database for issues related to the various phases of an AV-access life cycle. We excluded case reports; otherwise, there were no restrictions on the study size or design. We also excluded studies without clear definitions of: (1) the clinical use(s) of the intervention; (2) outcomes or measurements of outcomes in the study; or (3) the types of AV access involved in the study. A standardized data sheet was utilized to extract pertinent information from the included studies. A review of clinical outcomes, their measurements, and all relevant study end points used in prior publications dealing with AV-access creation, maturation, use, and maintenance was conducted. Clinical trial end points important from the perspectives of patients, clinicians, and administrators were considered. We assessed the end points’ adequacy, strengths, and weaknesses; identified common terminology with a view toward maintaining consistency; and assessed the need for additional relevant end points. An interventional study might be designed to affect any point within the evolution of the AV-access life cycle, which has been divided into five distinct clinical phases designated as shown in Figure 1. Each of these carries with it the potential for problems (Table 1). The first three phases also correspond to three AV-access developmental stages as shown in Figure 2. These three stages are more distinct and well differentiated for an AVF; however, they also characterize the evolution of an AVG. Time is not part of these definitions because it does not exert an influence on whether the outcome has been achieved. Developmental stages of arteriovenous access. AV, arteriovenous; AVF, arteriovenous fistula; AVG, arteriovenous graft; —, no entry. An AV communication is formed using either an autogenous vein or a graft. The clinical outcome for this phase is a patent AV access, either a stage 1 patent AVF or patent AVG. The attainment of this goal is demonstrated by the presence of blood flow which can be confirmed either directly using an imaging modality, or indirectly by physical examination (3). In ideal circumstances, an AVF is the best choice for a dialysis access. However, it may not be possible to create an AVF in every patient; in some it may not be clinically appropriate, and some that are created are not successful. In many of these cases an AVG is placed depending upon individual circumstances (4,5). The pediatric patient population with CKD is of special concern. In general, these patients have longer life expectancy than adult patients. Even if transplanted, the anticipated longevity of the graft is such that a return to hemodialysis can be expected. Therefore, optimal management of vascular access on the basis of long-term planning is essential. Despite this, most of these patients start dialysis with a catheter and continue with a catheter for long-term use. In contrast to decreasing use of catheters in all patients combined, catheter use in pediatric age incident patients increased from 2006 to 2014 (6). Compared with the adult CKD population, the accomplishment of a phase 1 AV access may require interventional studies that are specifically targeted toward this age group. Dialysis access steal syndrome may appear immediately upon the creation of an AV access. In a meta-analysis involving 21 reports, 464 cases were tabulated (7). Acute dialysis access steal syndrome (occurring immediately postoperatively or within hours) was seen in 104 cases; 87% were in patients with an AVG. During this phase, the AV access evolves to one that has the potential for being used as a hemodialysis access. In the case of an AVF, the clinical outcome is a stage 2 physiologically mature AVF defined by objective demonstration using duplex ultrasound of a minimum access-vessel internal diameter ≥5 mm and an access blood flow ≥500 ml/min. The duration of this phase is measured in weeks, because most AVFs that mature will do so in 4–8 weeks (3,8–14). The end point for an AVG is a stage 2 mature AVG. Multiple studies have shown a mature AVG to be clinically usable with a minimum access blood flow of 600 ml/min (15,16). The most commonly used material for an AVG is expanded polytetrafluoroethylene which typically requires a period of 3–6 weeks for wound healing, resolution of swelling, and incorporation of subcutaneous tissue. Although referred to as maturation, the process is obviously quite different from maturation of an AVF (15). With newer materials offering the benefit of early postoperative cannulation, an AVG can be ready for first cannulation (“mature”) after a period of hours to days (17,18). Successful AVF maturation is characterized by a continuous, progressive, and relatively rapid increase in access blood flow and access-vessel internal diameter sufficient to permit repetitive clinical use for hemodialysis. Studies have shown that access blood flow alone, or a combination of access blood flow and internal access-vessel diameter, are reliable indirect indicators of maturation and the future successful use of an AVF for hemodialysis (3,8–14) (Table 2). These metrics can be used as clinical trial outcomes to define a physiologically mature AVF. Predialysis AVF placement in patients with advanced CKD will predictably result in some patients having a physiologically mature AVF that will not be used for some period (19,20). Requiring clinical use as part of this definition would result in a penalty for enrolling predialysis patients, thus potentially limiting the eligible study population and in some cases introducing a case-selection bias. An access blood flow of 400–500 ml/min has been shown to have an accuracy of 53%–93% (10–13), a sensitivity of 67%–96% (3,10,12–14), and a specificity of 65%–90% (10,12–14) for predicting clinical AVF maturation. Collectively, these studies suggest that a minimum access blood flow threshold of 500 ml/min is appropriate as an indirect measure of AVF maturation. Only one study evaluated forearm and upper-arm AVFs separately (12), and found that using a threshold access blood flow of 600 ml/min for brachial-cephalic AVF had a sensitivity and specificity of 89% and 87%, respectively, for clinical AVF maturation. Even though an access blood flow of 350–500 ml/min has been reported in normally functioning AVFs (21), an access blood flow <400–500 ml/min has been associated with AVF thrombosis (22). A caveat is that this may relate to the prescribed dialysis blood flow rate prescribed for dialysis. A functioning fistula with an access blood flow of 350 ml/min might be acceptable with lower dialysis blood flow (e.g., 280 ml/min as with nocturnal hemodialysis) but would lead to recirculation in conventional hemodialysis, with a dialysis blood flow of ≥400 ml/min typically used in North America (23). The site for an access blood flow measurement should be the brachial artery at least 5 cm proximal to the anastomosis, regardless of whether one is dealing with a radial or a brachial artery–based AVF (3,14,24,25). Because the incidence of high bifurcation of the brachial artery is significant (26,27), care must be taken to assure that the measurement is being made from the brachial artery. Studies have reported that an access-vessel internal diameter threshold ranging from 4 to 5 mm correlates with success (Table 2); however, 5 mm should be adopted as the appropriate and more conservative end point to indirectly indicate AVF maturation (3,8,10,14). Combining both access blood flow and access vessel internal diameter (500 ml/min and 5 mm, respectively) was found to have a sensitivity of 84% and a specificity of 93% (14). Because access-vessel internal diameter criteria are based upon studies in which the measurements were performed without a tourniquet (3,8,14); this is recommended for defining an access as a physiologically mature AVF. The increase in both access blood flow and access-vessel internal diameter defining an AVF’s maturation occurs rather rapidly; however, on the basis of studies evaluating these changes over time (10,14,28), it seems appropriate that when a time value is required, 4 weeks is an appropriate minimum. AVG maturation is quite different than for an AVF. The diameter of the AVG is predetermined and access blood flow is very near its maximal level from the beginning. Thus, access blood flow and access-vessel internal diameter are not typically used as clinical trial end points for AVG. Nevertheless, in the optimal situation, remote upstream remodeling involving the feeding artery and downstream remodeling involving draining veins occur and importantly contribute to continued patency of the AVG. Although many cases can be salvaged (29,30), AVF failure-to-mature rates ranging from 20% to 60% have been reported (10,31–37). In 2014, 36% of created AVFs failed and the average time between placement and first use was 133 days (6). Many that are ultimately salvaged require more than one procedure to become clinically usable (38) and have a shortened primary patency rate, making repetitive interventions necessary for continued clinical use (39,40). The incidence of primary AVG failure has been reported to be in the range of 4%–11% resulting from surgical problems, graft characteristics, patient demographics, and patient comorbidity (41–44). A key challenge to comparing studies evaluating clinical outcomes in this maturation phase has been the wide variability in definitions of “maturation,” “primary failure,” and various AV-access patencies. 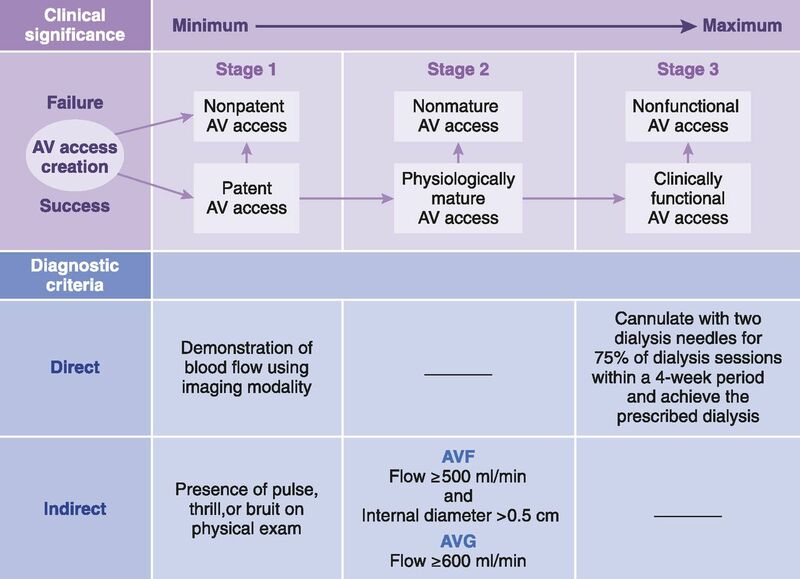 In this Kidney Healthcare Initiative series, definitions of terms relevant for evaluating clinical outcomes in this and other AV-access phases have been standardized (45). Although perioperative infection is uncommon with an AVF, a rate ranging from 1% to 3% has been reported for an AVG placed in the upper extremity, and rates >18% for those placed in the thigh (46,47). Subacute dialysis access steal syndrome (delayed but within 1 month of surgery) may be seen during the maturation phase of AV-access development. In a meta-analysis involving 464 cases, 97 subacute cases occurred and 79% were associated with AVFs (7). This phase is characterized by use of the AV access for dialysis—a stage 3 clinically functional AVF or clinically functional AVG. This is defined as an AV access that can be cannulated with two dialysis needles for at least 75% of dialysis sessions within a 4-week period to achieve the prescribed dialysis. Prior definitions indicating needle dimensions, dialysis blood-flow targets (e.g., >300 ml/min), and urea kinetic measurements (e.g., Kt/V) are not consistently applicable or feasible (48,49). For example, patients of small body habitus or those receiving prolonged dialysis (e.g., nocturnal or other slow continuous dialysis) can have well functioning fistulas using dialysis blood flow of 280 ml/min. This has been demonstrated in Japan, France, and Canada. Because more clinical trials need multisite international involvement, this is an important consideration for clinical trial end points and increased generalizability. Furthermore, the “timelessness” of definitions needs to be considered with newer dialysis machines and technologies (i.e., ones that use lower dialysis blood flow and dialysate flow rates). The use of urea kinetic modeling is impractical and very costly (two blood samples per dialysis run) if one needs to collect this information in a minimum 75% of dialysis sessions within 4 weeks. Depending on the type of dialysis, spKt/V, eKt/V, weekly standard Kt/V, or the urea reduction ratio may be used and are associated with various inconveniences for patients (i.e., need to wait 30–60 minutes to collect the second urea measurement). In addition, adequacy of dialysis on the basis of urea kinetic modeling involves many factors besides the AV access. For example, if a patient leaves early for dialysis or clots their circuit, this may adversely affect the Kt/V but the fistula may be functioning perfectly, clinically. In these instances, such a criterion as part of the clinical trial end point for AV-access clinical usability would be unjust. A time factor is required for a workable definition because persistence of clinical utility is also critically important. Because of the possibility of operator error resulting in cannulation problems with any new AV access, a criterion of cannulation for 75% of dialysis sessions is felt to be reasonable. As stated, this important clinical trial end point definition captures what is clinically important for the patient and the clinician—sustained reliable use of the AV access to provide the prescribed dialysis. Of note, clinical usability also depends upon patient-specific criteria that cannot be objectively quantified, such as an optimal depth, length, and location that allows it to be successfully cannulated. These and other considerations should be considered but might be difficult to capture as clinical trial end points. A study of cannulation-related complications in 158 patients with a newly created AV access found complications in the majority of patients (50), with more than ten miscannulations occurring in 37% of AVFs, and 19% of AVGs. Excessive depth, suboptimal location, or inadequate length of the cannulation segment can result in unsuccessful cannulation and/or infiltration (51). Cannulating too early can also result in problems (52,53). Although not a consistent finding (54), cannulation earlier than 1 month has been reported to be associated with a high risk of AVF failure (53). This phase is defined as continuous, effective, problem-free use of the AV access for hemodialysis. It begins once the AV access is deemed to be clinically functional and represents the ultimate criteria for judging success. Unfortunately, most cases will alternate between this phase and phase 5—dysfunction. The duration of this phase is indeterminate, limited only by the occurrence of problems and complications. The most common complication associated with an AV access is venous stenosis which can lead to thrombosis, the most common cause of late AV-access loss (55). In a meta-analysis of AVF patency reports, it was determined that by 1 year, 40% of all AVFs either failed or required at least one intervention (19). When primary failure was included in the calculation of patency rate, the primary and cumulative patency rate was 60% and 71% at 1 year, and 51% and 64% at 2 years, respectively. In another meta-analysis on the basis of 34 relevant studies, the primary and cumulative patency rate for AVGs at 6 and 18 months was 58% and 33%, and 76% and 55%, respectively (56). Percutaneous angioplasty has become the treatment of choice for venous stenosis. Although there are special categories of lesions that behave differently, peripheral draining vein stenotic lesions behave similarly in an AVF and an AVG. Angioplasty results for peripheral vein stenosis from a pooled cohort of 2166 cases from 15 published studies, including both AVFs and AVGs, showed a postintervention primary patency of 62% and a cumulative patency of 85% at 6 months (57–71). A hemodynamically significant lesion can develop anywhere in the arterial tree from the ascending aorta to the arterial anastomosis. Reports of inflow stenosis in dysfunctional AVGs range between 14% and 42% (72–74), and between 6% and 18% in AVFs (55,73,75). Over time, progressive stenosis can result in AV access thrombosis. In general, 100% of all thrombosed AVFs (55), and 85%–90% of AVGs (76), are associated with an anatomic lesion. The frequency of AVG thrombosis is approximately 1–1.5 per patient per year (76). The thrombosis rate for AVFs is reported to be approximately one-sixth that for an AVG (77). In a study involving 380 cases of endovascular-treated AVG thrombosis, postintervention primary patency rates at 1, 2, 3, and 6 months, and 1 year were 66%, 52%, 44%, 31%, and 10%, respectively (78). AVF thrombosis treatment success can range from 88% to 100%, with postintervention primary patency rates ranging from 20% to 56% at 6 months and 27% to 40% at 1 year (64,79–83). Pseudoaneurysm formation in AVGs is a common cannulation-related complication (84), as is aneurysm formation in AVFs (56,85). Degenerative changes in the vein wall that characterize these anomalies generally result from the combination of repeated punctures and hemodynamic factors, such as downstream peripheral or central vein stenosis (84,86). As a pseudoaneurysm/aneurysm develops and expands, it can lead to complications such as pain, objectionable cosmetic appearance, difficult cannulation, risk of bleeding, and problems with access blood flow (84,86). AV-access infection may present in the form of cellulitis, an abscess, septic emboli, bacteremia, and sepsis (87–89), and is a common cause of AVG loss (90,91). In a meta-analysis, it was found that the annual risk of a fatal infection with an AVG was 0.04, and 0.03 for an AVF. The relative risk for persons using an AVG versus an AVF was 1.36 (95% confidence interval, 1.17 to 1.58) for a fatal infection and 2.76 (95% confidence interval, 2.13 to 3.58) for a nonfatal infection (92). An AV access produces a hyperdynamic state that increases cardiac workload and exerts significant effects on cardiac systolic and diastolic performance (93). In 2014, 44% patients receiving dialysis were reported to have congestive heart failure (6). In addition, dialysis access steal syndrome can develop secondary to a high access–blood flow (94). Problems associated with a high access–blood flow occur more commonly with an AVF (95). There are challenges when considering high access–blood flow in a clinical trial. First, there is no uniformly accepted definition of a high access–blood flow. Second, the access–blood flow level that is problematic will vary with each patient on the basis of comorbidities, especially the severity of cardiac and peripheral arterial disease. Perhaps the most objective criterion is the ratio of access blood flow to cardiac output, referred to as cardio-pulmonary recirculation. In a prospective study of 96 patients (96), access blood flow values ≥2.0 L/min predicted the occurrence of high-output cardiac failure with a sensitivity of 89% and specificity of 100%. Cardio-pulmonary recirculation values ≥20% had a sensitivity of 100% and a specificity of 74.7%. Dialysis access steal syndrome can result in chronic hand ischemia (occurring >1 month postsurgery). In a series of 464 cases (7), chronic dialysis access steal syndrome was seen in 263 cases, 88% in patients with an AVF. Vascular access type is an important determinant of quality of life for patients receiving dialysis. Reports indicate that patients prefer an AVF (97); however, preference does not infer that problems do not exist. For reasons that are not well understood, up to 30% of eligible patients refuse AVF creation (98). In a meta-analysis (99), six themes related to this issue were identified: (1) heightened vulnerability, (2) disfigurement, (3) mechanization of the body, (4) impingement on way of life, (5) self-preservation and ownership, and (6) confronting decisions and consequences. In general, patients with AV access report pain with cannulation as their most common vascular access–related problem. Although studies indicate that cannulation is associated with an acceptable level of discomfort and a preference for an AVF (97,100), there are patients that report a debilitating fear of needles, pain, and dread of needle-associated complications (99). Those with central venous dialysis catheters have reported avoidance of needles as the best aspect of their access (101). This phase is defined as the occurrence of a problem that interferes with the routine use of the AV access, threatens patency or results in a loss of patency, presents a significant risk of medical complication, or adversely affects the patient’s sense of wellbeing. If the attributable problem can be resolved, the AV access returns to phase 4. Limiting the time spent in phase 5 is an important goal and timeliness in addressing problems is critically important. In contrast to the results obtained in the treatment of venous stenosis in general, there are subgroups that are more problematic. Central venous stenosis is a particularly serious problem. The reported technical success rate for angioplasty ranges from 70% to 90%, with a 6- and 12-month postintervention primary patency rate of 23%–63% and 12%–50%, respectively (57,59,102–107). The most common stenotic site in an AVG is at the venous anastomosis. This lesion is resistant to dilatation and associated with poor primary patency. In a pooled cohort of 456 cases derived from four studies, the technical success rate was 81%, and the postintervention primary and cumulative patency at 6 months were 55% and 76%, respectively (57,108–112). Lesions referred to as “swing-point stenosis” are extremely problematic. In a study of 278 patients with AVF-associated venous stenosis, 46% fell into this category (113). These are lesions occurring where the course of the vein makes a sharp curved angle creating nonlaminar flow resulting in neointimal hyperplasia. There are three sites that qualify under the swing-point definition: (1) juxta-anastomotic stenosis which involves the first 2–3 cm proximal to the anastomosis, (2) the angle of transposition created when the basilic vein is transposed laterally and superficialized during access surgery, and (3) the cephalic arch. These swing-point lesions are resistant to dilatation and associated with an increased level of procedure-related complications (67,114,115). Maintenance procedures can in themselves create problems. Angioplasty has been shown to increase the recurrence rate of venous stenosis (116–118). In addition, procedure-related complications can occur with any procedure, and may result in a loss of the AV access. The most frequently encountered complication with angioplasty is venous rupture occurring in 2%–6% of cases, leading to AV-access loss in 5%–30% of those in whom it occurs (64,119,120). Stenotic lesions resistant to angioplasty therapy and their recurrence are major problems for the patient with an AV access (121,122). Repetitive angioplasty has been a cause for concern, because endothelial injury can result and potentiate neointimal hyperplasia, leading to a cycle of lesion recurrence (39,123). The major problem encountered in phase 5 is loss of the AV access. Although maintenance procedures performed on AV access are generally successful (64), eventually a point is reached where the access either cannot or should not be salvaged. In a meta-analysis, the cumulative patency for a functioning AVF was 86% at 6 months and 77% at 18 months. The corresponding values for an AVG were 76% and 55%, respectively (56). In an AVF meta-analysis excluding primary failure, the pooled cumulative patency rate was 82% at 1 year and 73% at 2 years (19). In these AV-access case series, the most common event marking the end of cumulative patency was unresolved AV-access thrombosis. There is a potential for directing interventional trial outcomes toward any phase of the AV-access life cycle. However, it is anticipated that these trials can be classified into a limited number of categories (Table 3). In addition, the use of standardized definitions (45) is of critical importance and will facilitate trial design, implementation, analysis, interpretation, and comparison. The report of a clinical trial needs to provide information relative to both the safety and effectiveness of the intervention so that its risk-benefit relationship can be assessed. The presentation of data concerning issues such as anatomic success, device success, and procedure success are appropriate; however, clinical success demonstrating a definite clinical benefit to the patient is of paramount importance. End points related to interventional trials need to incorporate the economic effect of their use, the clinical relevance of the study, the ease of use/implementation, the consequences of this use, and the time required to realize their effect. The extent to which this information is provided will contribute to the degree of confidence in the results and conclusions of the trial. G.A.B., consultant to Davita/Lifeline Vascular Access. T.S.H., Editorial Board of Journal of Vascular Surgery, Scientific Advisory Board of University of Michigan Cardiovascular Center. M.H.G., employee of Hancock Jaffe Labs, consultant to Merit Medical Systems, Inc., Proteon Therapeutics, and TVA Medical. A.A.A.-J., none. D.B., none. D.L.C., none. J.H.L., consultant to CR Bard, CryoLife, Inc., and InnAVasc Inc.; ownership interest in Humacyte, Inc., and InnAVasc Inc.; research funding from National Institutes of Health, W.L. Gore & Associates, Inc., CryoLife Inc., and Proteon Therapeutics; honoraria from W.L. Gore & Associates, Inc., CR Bard, and CryoLife Inc. T.C.L., consultant to Proteon Therapeutics. V.D.N., consultant to Ardea Biosciences. D.S., employee of Merit Medical Systems Inc. S.O.T., consultant to CR Bard, Peripheral Vascular, B Braun, Cook, Teleflex, MedComp, and Lutonix; patents and inventions—Teleflex, Cook. P.R.-C., consultant to W.L. Gore & Associates, Inc., Medtronic, Bard Peripheral Vascular, Cook, CorMedix, Fibrogen, and TVA; ownership interest in and Chief Scientific Officer and founder of Inovasc; research funding from Cook Medical (pending) and Bard Peripheral Vascular (pending); honoraria from W.L. Gore & Associates, Inc., Medtronic, Bard Peripheral Vascular, and Cook. S.S., speaker and/or training for W.L. Gore & Associates, Inc.; consultant to Lutonix, Inc., TVA Medical, Inc., and Vascular Therapies, Inc. M.U., consultant to CR Bard. H.W., consultant to Proteon Therapeutics, and Merit Medical Systems, Inc.; honorarium from Proteon Therapeutics. K.W., none. T.H.Y., none. C.E.L., consultant to W.L. Gore & Associates, Inc., Atrium. See related articles, “Clinical Trial End Points for Hemodialysis Vascular Access: Background, Rationale, and Definitions,” “Recommended Clinical Trial End Points for Dialysis Catheters,” and “FDA Regulatory Perspectives for Studies on Hemodialysis Vascular Access,” on pages 490–494, 495–500 and 513–518, respectively. This article contains supplemental material online at http://cjasn.asnjournals.org/lookup/suppl/doi:10.2215/CJN.11531116/-/DCSupplemental. U.S. Renal Data System: Annual Data Report. National Institutes of Health, National Institute of Diabetes and Digestive and Kidney Diseases, Bethesda, MD, 2016. Available at: DOPPS Practice Monitor: Prescribed blood flow rate, continuous, national sample (http://www.dopps.org/dpm/DPMSlideBrowser.aspx?type=Topic&id=4). Accessed March 8, 2017.